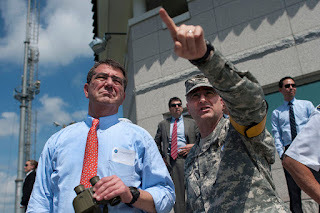 TNA: DoD Admits Invasion of Texas Associated with "Jade Helm 15"
DoD Admits Invasion of Texas Associated with "Jade Helm 15"
WASHINGTON, D.C. (The Nil Admirari) - DoD Secretary Ashton B. Carter admitted today there will be an invasion of Texas associated with the "Jade Helm 15" U.S. military exercise that has many Texans worried their state will be placed under martial law. Ashton cautioned Texans the invasion "isn't the kind you are so concerned about." "The DoD is going to use one-fourth of its 2015 budget on mental health workers to descend upon Texas in the next few days, weeks, and probably months. Their mission will be to assess and treat what we believe is a mental health epidemic there," said Carter. A member of the press asked Carter how serious the epidemic was. "Well, Senator Cruz (R-TX) and Congressman Gohmert (R-TX-01) keep asking if we are preparing to invade Texas, and are encouraging people who believe Walmarts are being used as staging grounds," stated Carter. Secretary Carter added, "The cognitive dissonance required to think you are the epitome of an American patriot while you openly despise your own government and mistrust its soldiers is awe-inspiring. We have some serious work to do." Carter said the mission has been dubbed "Operation Loon Star" and afflicted Texans will be encouraged to see psychiatric professionals by giving them incentives like surplus military hardware from Iraq after successful treatment.